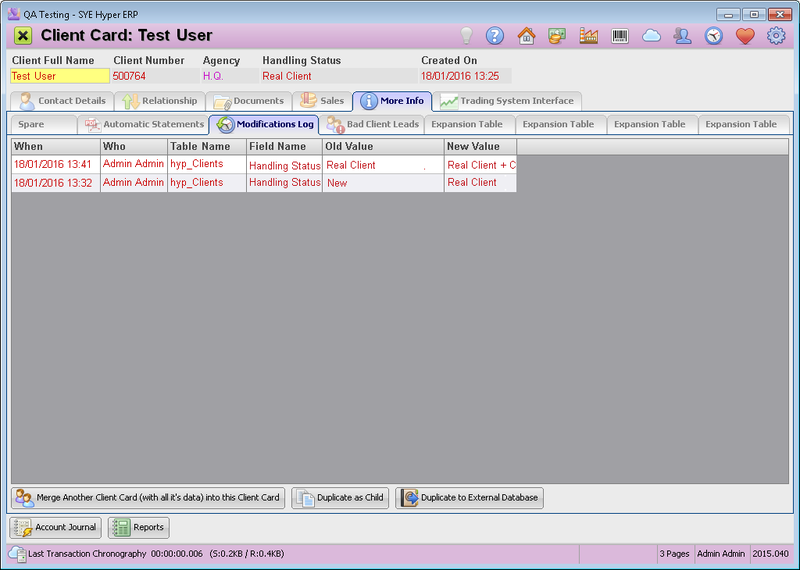 This tab displays all of the modification that have been made in the client card. The modifications are automatically updated by the system and can not be deleted. A new modification record will be created for any modification made by the user. The table presents the time when the modification was done, the User Name, Table name, Field Name Old Value and New Value. This tool allows the manager to follow every modification in order to prevent unwanted modifications. Merge Another Client Card (with all it's data) into this client card. Merge a chosen Client Card into this Client card. In the "Search for Client" window, Search for the required client and press the Select (F6) button. All of the chosen client records and documents will be merged to this client. A new "Additional Contact" will be created with the merged identification and contact details. A new client card will be created with this client identification and contact details. The new Client card will be marked as "Child Client" of the original Client Card.